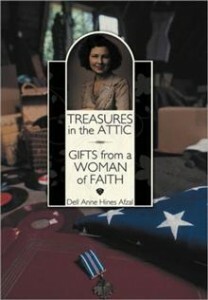 Treasures in the Attic: Gifts from a Woman of Faith is the true story of author Dell Anne Hines Afzal’s grandmother, Lois Annie, and the treasures she left their family. It is documented in memory of her love and strength and shows the trials and tribulations of how she lived her life. It also shows an extremely hard-working, honest, and loving woman who would not allow those heartaches she suffered in her life to limit or taint her examples to her children, grandchildren, and great-grandchildren. Learning of her tragedies and hardships and how she survived them has given Afzal a sense of purpose and a belief that she can do all things through faith and hard work. 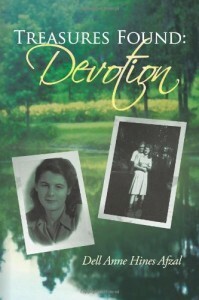 Her purpose in sharing her grandmother’s life with the reader is to offer comfort and hope to those who are suffering. She offers her prayers and absolute faith in the understanding that whatever pitfalls may be thrown our way, we must never give up and we are not alone. The treasures found in her attic on the day she moved from her treasured home of over fifty years offer a glimpse of true caring and respect she left for those she loves. The miracle of the recovery of those gifts and a lost member of the family will open your heart and soul to the true miracles of life. The time is 1991, and the family has moved their matriarch from her treasured home of over five decades to small-town living USA. Two of the family’s daughters have recovered lost items from their grandmother’s attic lost for decades. The discovery leads the author on a journey to uncover their beginning-that of family. The treasures recovered that day will begin a journey back into time and offer a glimpse of a simpler and sweeter time and place. Travel back in time to meet two youngsters straight from the rural North Central Florida backwoods and witness their growth to adulthood, straight into a full and wonderful life of love, laughter, and devotion. The characters of these stories are true living characters of my own family and are much loved and respected. Witness a treasured letter from a successful businessman and much revered relative that contains a heartfelt thanks to a mentor. This letter would open the author’s heart, mind, and soul to discover her beginnings. The stories contained herein are lessons for those descendants left and hope they will know from whence they came.